Is Your Riparian Area Healthy? JANUARY 2019 - Is your property adjacent to a river or stream? If the answer is yes, then you have a riparian area. Riparian areas are transitional areas between water and uplands. These valuable areas provide a filter for runoff, floodwater storage, wildlife habitat, groundwater recharge, forage and timber resources, and recreation to name a few. Take this self-assessment to determine how your riparian area is doing. Check each box that applies to your property. My livestock have unrestricted access to the streambank and water’s edge. My livestock have access to the streambank for more than 30 days. 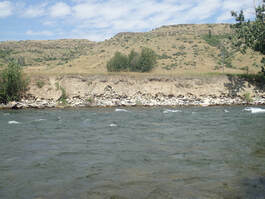 Streambanks are actively eroding and have steep vertical edges (see photo above). .Vegetation (including native shrubs and trees) are removed or replaced with lawn and/or are mowed to the bank edge. Rip-rap is present, or I am considering it to stabilize my streambank. I spray herbicides/pesticides on my lawn or pasture close to the water’s edge (within the high-water mark). I do NOT take regular soil samples (at least every 3 years) of my lawn/pasture near the water prior to fertilization. Noxious weeds such as spotted knapweed, leafy spurge, Canada thistle, hoary alyssum or others are present. If you answered yes to any of these questions and would like more information on how to address these resource concerns contributing to the weakening of the health of the watershed, then contact the Stillwater Valley Watershed Council at (406) 780-1249, or the local Natural Resources Conservation Service office in Columbus at (406)322- 5359 x109. Technical assistance can be provided with the possibility of funding opportunities to help minimize impacts to the riparian ecosystem. Great video from NRCS and Keogh Ranch! Noel, you were an instrumental part of the formation of the SVWC, we are lucky to have you on our board and an advocate for natural resources in the Stillwater watershed! Those of us that have been around agriculture tend to know about noxious weeds and the potential impacts they can have on the landscape. My parents managed a ranch growing up, so I spent many summer hours pulling spotted knapweed, chopping down houndstongue and burdock and in later years, spraying weeds. I also spent countless hours fishing, riding horseback and enjoying everything ranch life has to offer a kid. Now that I am older, I spend a lot of time enjoying the outdoors and recreating on public lands. Each year, it becomes more and more apparent to me that the general public lacks knowledge about noxious weeds, and frankly, most don’t care or understand the impacts they can have on our beautiful state. According to Montana State University Extension, Montana’s Noxious Weeds publication, approximately 8.3 million acres or 9% of Montana is covered in noxious weeds. Noxious weeds are described as exotic plant species that can form dense infestations and may render land unfit for agriculture, forestry, livestock, wildlife or other beneficial uses or that harm native plant communities. These weeds are not just a farmer’s problem, they have the potential to invade not only cropland, but can also have detrimental impacts on rangelands and forestlands, and riparian areas. They can increase soil erosion, displace native plants, decrease biodiversity, degrade stream and riverbanks, and decrease available forage for livestock and wildlife. These factors reduce recreation value. Noxious weeds have the competitive advantage over most native plants because many have deep root systems which allows them to get started earlier in the spring and continue to grow later in the year. They also have no natural predators to keep them in check as they do in their native habitat. Generally, noxious weeds have the ability to produce thousands of seeds annually, which can remain viable in the soil for several years. Some plants, such as spotted knapweed, release chemicals that inhibit the growth of other plants, which is believed to give it a competitive advantage. Weeds that invade streambanks and riparian areas, can decrease bank stability by replacing better suited native grasses, shrubs and trees. Lack of bank stability can speed up erosion, increase sediment deposits in the stream, and increase water temperatures by replacing tall stature, native plants. This can have a direct impact on something Montana is noted for, its clean water and blue-ribbon fisheries. Everyone can make a difference in the war against noxious weeds. Many trailheads and fishing access sites have educational signs about noxious weeds. Take a look before heading off on your next hike or float, and keep an eye out for the weeds that are listed. Contact responsible public agencies if you find an infestation. Or if the infestation is small, take a minute or two and hand pull a few. Many weeds can be controlled by hand pulling (gloves are recommended) to ensure the plants don’t go to seed, carry a small bag and pack them out with you. If you find weed seeds, such as houndstongue, on your clothes, gear or your dog, properly dispose of the seeds instead of throwing them on the ground. Rafting and fishing guides are on the water almost daily, and can be instrumental in fighting the spread of noxious weeds. Guides, and those of us that enjoy recreating on Montana’s waters can make an impact by reporting new infestations or pulling a few weeds when they stop for lunch and educating clients/friends/family about the effects noxious weeds can have on native landscapes. If you plan to travel with pack animals on public lands, it is a good idea to feed the animals Noxious Weed Seed Free Forage (NWSFF) for 3 days prior to taking them on public lands. It is required that you feed certified weed seed-free forage (hay, pellets, etc.) while animals are on public lands. Thoroughly clean vehicles, including ATV and UTV’s, so seeds are not dispersed to other areas. A Montana State University study showed that seeds can travel 160 miles in dry conditions on a vehicle before falling off. If possible, don’t drive recreational vehicles through weed patches, and stay on designated trails. Get involved with local county weed districts, or nonprofit conservation groups such as local watershed or weed management groups and volunteer! Check out our local watershed group, Stillwater Valley Watershed Council at http://www.stillwatervalleywatershed.com/. Sources: *Montana Outdoors, July-August 2011. Open Space Invaders by David Stalling. *Montana’s Noxious Weeds, April 2018 (EB0159) by Monica Pokorny and Jane Mangold. * Washing Vehicles Prevents Weed Spread. MT NRCS fact sheet. August 2017. MAY 2018 - It’s Montana’s Wildfire Awareness Month! Is your home and family prepared? Take action and prepare now for this year’s wildfire season. Remove needles and leaves from your gutters, around your homes foundation, and under decks. Remove lower branches from your trees. Make and rehearse your evacuation plan with your family. It’s Wildfire Awareness Month in Montana! Are you and your home ready? Do you have trees and shrubs touching your home or wood chips surrounding your home? Consider trimming shrubs and trees so they are at least 3 feet from your home and replacing flammable landscape material with nonflammable options like gravel or stones. For more wildfire safe landscaping ideas go to Firewise.org. It’s Wildfire Awareness Month! Are you prepared? Wildfires can be unpredictable and move fast. You may have to evacuate your home quickly. Does your family have an evacuation plan? Have at least 2 evacuation routes and make a grab and go bag with important family documents, medications, and other essential items. For more information on useful items to include visit www.ready.gov. Residents living in areas at risk of wildfire can make a difference. Keep the home ignition zone (30 feet around structure) clear of dense vegetation. Clean out gutters, roofs and other areas where a spark could ignite. Use ignition resistant building materials when building or remodeling your home. Create and practice your evacuation route with your family. Become a champion for wildfire safety in your community by encouraging others to take action. Work with neighbors in your community to reduce wildfire risk benefits the entire community. To say it’s been a big, and impressive, snow year would be an understatement. Snowpack measurements on April 1st, 2018 resulted in snowpack totals that are well above normal for almost all river basins in the state. Even though spring is here, there is still over a month to go in the snowpack accumulation season at the mid to high elevations. Some regions of the state remain near or record high for April 1st, and the snowpack in the headwaters of the Clark’s Fork of the Yellowstone is setting all-time records water-year peak snow water contained in the snowpack. Record Snowpack for April 1st, 2018. Streamflow forecasts for the April 1st – July 31st period reflect the above normal snowpack conditions and are well above average for the period. Please take a look at the individual basins within the report for more detailed information on regional conditions and water supply forecasts. The NRCS Montana Snow Survey staff will continue to monitor conditions throughout April and will provide updated information on May 1st regarding snowpack and water supply forecast. In the meantime; daily updates on snowpack, precipitation, streamflow and drought conditions can be found in the links below. To view the Water Supply Outlook Report click on the image below.